Happy Tuesday to ya! 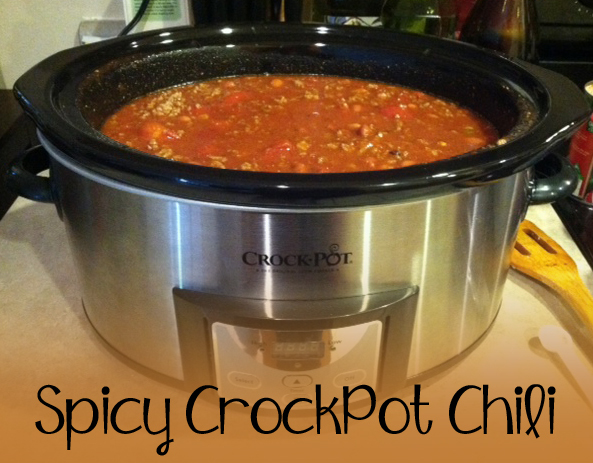 It’s another lovely Fall day here in Springfield, so in honor of the cooler temps and changing leaves, I have a new Crockpot Recipe to share! 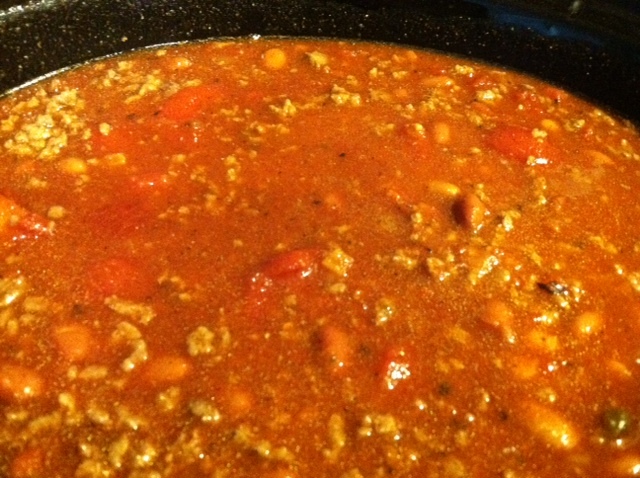 2 cans of diced tomatoes in sauce for chili – spicier the better! 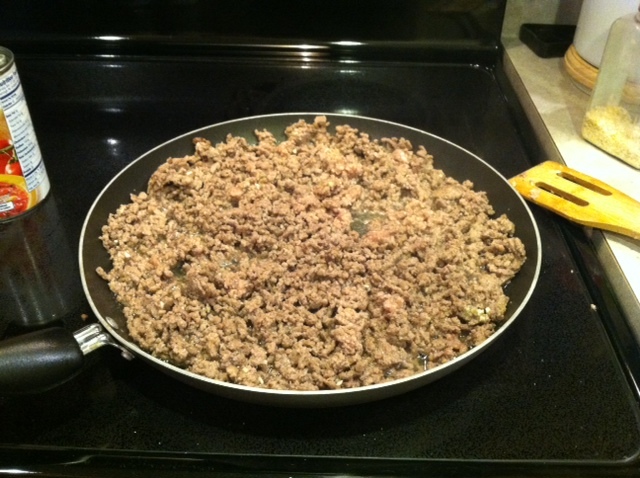 Begin by browning the ground beef in a large skillet. Season with the garlic salt and drain well. 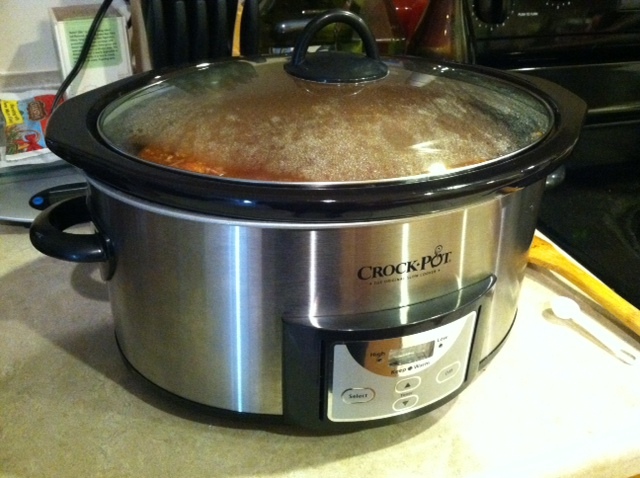 Once your meat is well drained, put it into your Crockpot or slow-cooker. 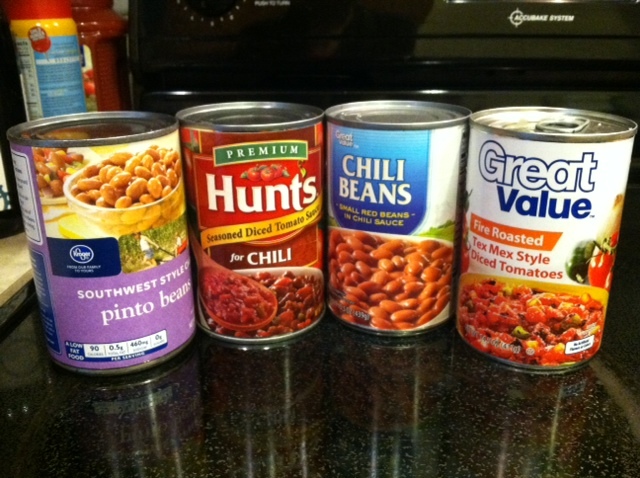 On top of the meat add the cans of beans, diced tomatoes, tomato sauce, stewed tomatoes, and diced red onion. Stir well to combine and add a little water if the mix seems too thick for your liking. This particular batch ended up being a little too soupy, but it was still tasty! Next, add your seasonings – the chili powder, cumin, and minced onions. Stir this well to combine. Now this is where your taste-tester needs to step in. If you want it to be spicy (like Nick does! ), you can add some hot sauce, extra salt & pepper, or even some crushed red pepper here. Give it a taste and doctor it up how you like! Now put your Crockpot on the Low setting and cover it. 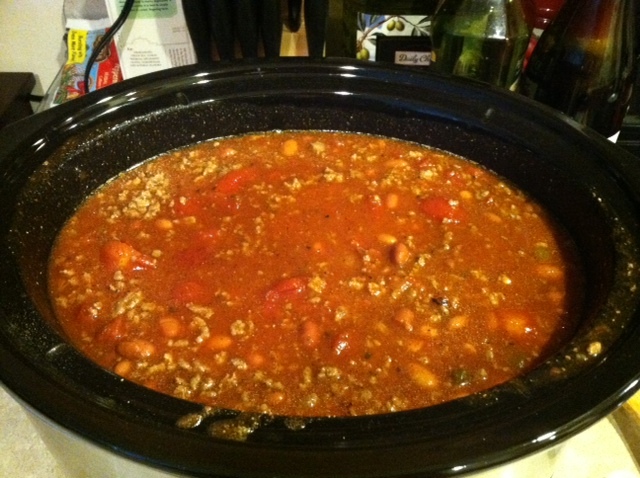 Let the chili cook on low for around 5-6 hours. Be sure to keep the lid on the whole time! I only opened it to stir about 2 times to make sure it wasn’t sticking to the bottom. 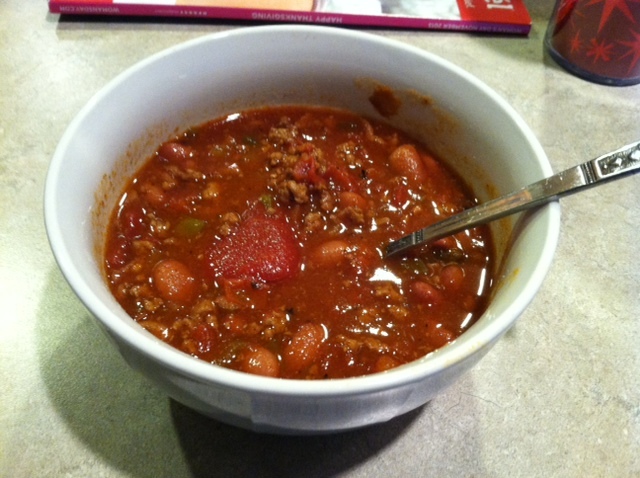 By the time my chili had been cooking 6 hours, it was boiling and ready for dinner. YUM!! I’m still eating on this stuff for my lunches this week. It’s an awesome treat in the middle of my day. 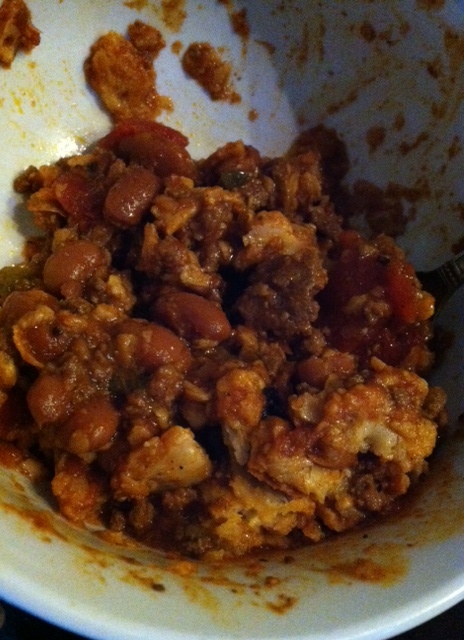 I’ve also been adding a spoonful of cottage cheese into my chili to make it a little creamy and cool it down a little. You should definitely give it a try. I hope you all have time to break out your Crockpot soon. 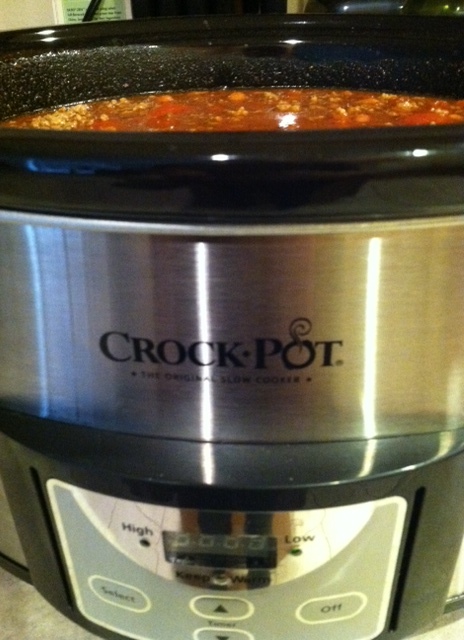 It’s that time of year where the cozy smell of chili coming from your kitchen NEEDS to happen. Haha, at least I think so. Hope you’re having a great Tuesday! Get out there and enjoy this lovely sweater weather!